Our buckets are 3.5 gallons- a perfect size for your kitchen.You can also choose 5 gallons for the same price. 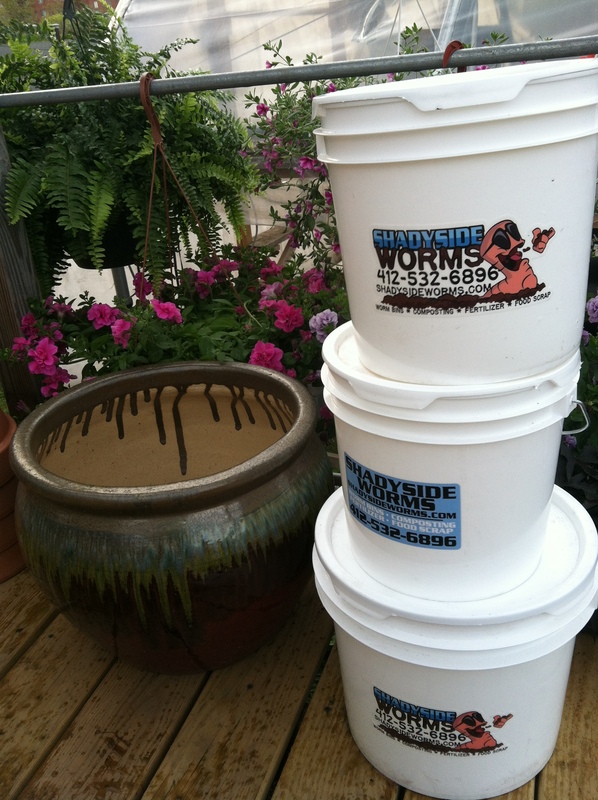 Shadyside Worms will provide you with a food grade composting bucket and lid for your food scraps and other composting items. The size of the bucket can be suited to your household needs, but the amount of worm castings you receive at the end of your subscription will be the same. Use your bucket to throw your food scraps into during the week. We will provide guidelines and tips for what our worms like/need to eat, and how to keep your bucket clean no more odoriferous than your normal kitchen garbage can. 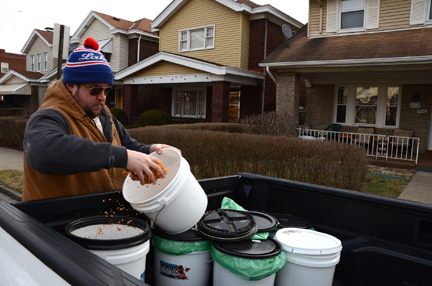 We will pick up your bucket of food scraps from your home on a weekly basis. At the time of pick-up we will drop off a clean bucket for you to use. If you aren’t able to put out your bucket, or have a large dinner party planned, contact us for a next-day pickup. After a three month period you will be eligible for a delivery of fresh worm castings in return. Our goal is to help our customers achieve a good return for your gardening or household needs, and help you understand the simple exchange of waste for fertilizer without the hassle or space needed for a worm bin of your own. After your 3 month subscription is done, you can renew your membership to the program with another purchase. If you are happy with the program and wish to keep the service uninterrupted, we will gladly sign you up for an annual subscription. Pick ups are every week, and year round. We use sawdust to help keep your buckets clean. In early spring we make a seed starting mix using worm castings to deliver to your door. Shares are pretty consistent every year, roughly 16 quarts. In addition to seed starting mix, we also offer bulk compost throughout the season starting in May. We deliver up to two 20 lb. bags each week until your share is filled. Shares usually land at around 300-320 lbs. per season(May-Aug). If you would prefer a nutrient rich fertilizer, we also offer worm castings that can be substituted for your bulk compost orders. One 4 lb. bag goes a long way for fertilizer or making compost tea. Worm castings can be used in your garden or your indoor houseplants. Lastly, in October we deliver potting soil. We make our potting soil from scratch using our compost and worm castings for plant food. Each customer is eligible for one large bag of potting soil, or you may substitute extra bags for your bulk compost shares if you prefer this product. WORM COMPOST DONATION: Urban agriculture projects in your neighborhood need organic soil and fertilizer. Give them a hand by donating your share! When you get started in the compost exchange program, you can designate a garden or non-profit of your choice, or choose from a list of organizations we work with. The compost exchange is a very convenient service for anyone that is short on time or space for composting. By picking up your food scraps from your home, and delivering the castings back to you, we hope to make it easier for you to have a healthy green thumb in your yard or home. Along the way we hope to educate you and prepare you for a time when you may want to try your own vermiculture system. We donated a truckload of compost to La Escuelita Arcoiris for the kids to learn how to garden and grow their own food! Every year we donate to Pittsburgh Mercy to help with their Nature Related Programming.